On the water, I think of myself in a different role, a different persona, depending on what I’m throwing on the end of my line. Fishing dries and nymphs I’m The Disarmer—my job is to recede into the background, become invisible, do no wrong. Swinging flies for steelhead I’m The Enticer—I do whatever I can to show my streamer’s best side for as long as cfs permits. But my favorite gig is playing a streamer-stripping salesman I call The Persuader, who recently came out for his first trip of the season. I was fishing with my friend Tom Lynch, aka “The Fish Whisperer,” aka “The Prince of Darkness.” I’d been inordinately excited for this outing, not because Tom has the biggest brown trout in the state of Michigan on speed dial, though he does, but because I was going to get a chance to tinker with his latest streamer, the Triple D. Basically the Triple D is what happens when a Rapala, a Zoo Cougar and a Slug-Go drink too much tequila and nine months later deliver their love-child straight into a vat of growth hormone. It’s pretty big, pretty bad, and in the right hands can be made to perform 180s and 360s, swoons and digs, shimmies and boils. It’s basically a fly you can freestyle. That day we fished the 10-inch version on a 350 grain sink tip on an afternoon that might have have hit 32 degrees. It wasn’t college. It wasn’t grad school. It was a one-day post-doc in the rhetoric of the streamer, a crash course in the Art of Persuading the donkey-est donkey-esque brown trout to eat. 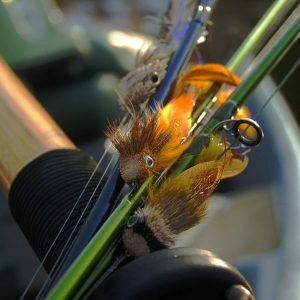 Tom’s streamer workshop boiled down to a few simple ideas worth mulling over the next time you find yourself on true trophy water. 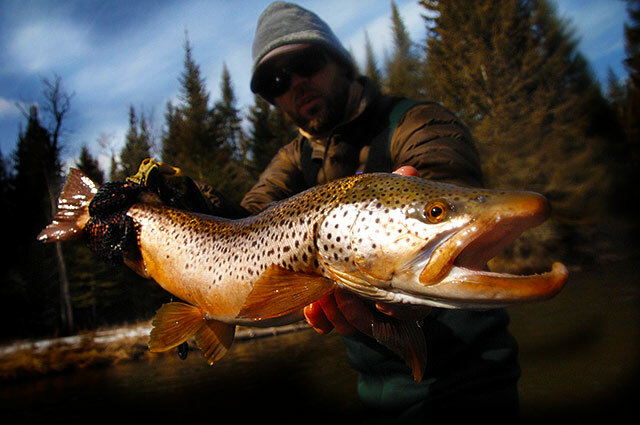 Unlike brookies and rainbows, browns can get pretty old. Depending on food availability, fishing pressure, and growth rates, a brown trout over 25 inches might be old enough to drive a car, vote, or make a run at House Rep. Which is to say that the fish you’re pursuing is bigger, badder, and more efficient than your usual quarry. If he were a person, he’d be the guy in the Dos Equis commercials: he doesn’t eat often, but when he does he prefers something that counts. Up to twelve. Think flies closer to a foot than half a foot in length. When making presentations to a mature, world-weary brown trout, your credentials need to be impeccable—as Tom likes to say, “If a trout starts thinking, you’re losing.” Credibility emerges from the way you do, and do not, retrieve. Erratic, arrhythmic, and variegated retrieves are what fly here. Mindless, steady, staccato strips do not. The hardest part of fishing a fly like the Triple D the right way isn’t the physical component (though that can be pretty grueling). It’s the mental challenge of mixing it up during each and every cast, again and again over many, many miles of river. Since The Persuader must work all day long, it’s essential to select the right equipment and strategy for the job. For us this meant fast action 8- and 9-weight rods and plenty of calories in the form of candy, sandwiches and energy drinks. Not essential, but very handy, was a complete and utter disregard for bicep pain, back aches, and blisters. Making a substantial cast and working the fly all the way back to the boat (then working it more at the boat) gives you the time and space to create “moments of opportunity” and “moments of urgency” that appeal to the deeper instincts of a fish. Moments of opportunity are your pregnant pauses, those between-strip intervals when you let the fly fall into a death swoon from which, to the fish’s eyes, it may not recover. The key is to build a few such moments into your cast, with at least one of those moments being early in the retrieve. Doing so gives you space to work a following fish before you run out of river. Anyone who has ever messed with a cat by yanking around some yarn understands moments of urgency. They refer to those final moments of access when a predator becomes aware of the fleetingness of its opportunity and is triggered into attacking—the cat launching itself the moment before its hard-stalked yarn disappears behind a chair. In addition to moments of urgency you create mid-retrieve, be mindful of that vector in which your fly leaves the water. Lifting your fly off the water slowly and enticingly can make the difference in rolling a fish you didn’t even know was there. How did my streamer post-doc end up? By day’s end we had rolled 7 fish in the low 20s. One of those, which we estimated at 25 inches, was lost boat-side not two miles out from the launch—a heartbreaker given the very real prospect of going 0-for during the rest of the day. But redemption, sweet redemption, came four hours and 7 miles later when I boated a 26.5 inch fish whose shark-like take left a permanent dent in the film. Was I sore the next day? You bet. I’m still sore, in fact, five days later.